Teresa is a TSO Supertech dedicated to providing quality care to every patient she meets. 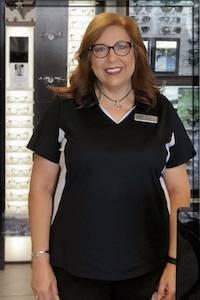 Her retirement after seventeen years in the field of education was short lived as her passion for learning new things led her to take on the challenge of beginning a new career as an optometric technician. She’s currently working on her CPOA certification to further her knowledge in the field. She married her high school sweetheart and they have a son, two dogs and two cats. She and her husband have been involved in ministry since 1990 and in 2004 they started a home church where they continue to serve the community. When she’s not hard at work, she likes spending time in her vegetable garden and sharing the fruits of her labor with family and friends. She enjoys a variety of music genres and is seriously considering going from playing percussion instruments to playing drums! She loves to BBQ and entertain those near and dear to her.